Understanding the drivers and inhibitors of economic growth is critical for promoting development in less developed countries, including India. 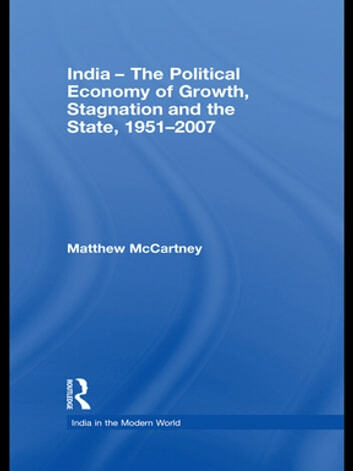 This book examines economic growth in India from 1951 to the present, challenging many accepted orthodox views. It argues that growth and stagnation should be considered over the medium term, and that the precise role of the state – in relation to particular historical and political-economic circumstances – is more important than the overall level of state involvement or disengagement. The book uses an empirical approach to contend that the state has an important role in several key areas including: mobilising a surplus; allocating the surplus in an efficient way to productive investment projects; and in building institutions (including political parties) through which conflict can managed between the different losers and rent-seekers affected by economic changes. It shows how, over time and in periods of growth and stagnation, the state in India has acted in key areas, and how the actions of the state has had a profound impact on economic outcomes. Overall, the book makes a major contribution to understanding the economic history of development in India and to understanding the role of the state in economic development more generally. Does Aid Work in India?